Your 14-inch doll will be ready for an afternoon party or lunch with friends when she's wearing this stunning, chiffon, tea-length doll sundress. 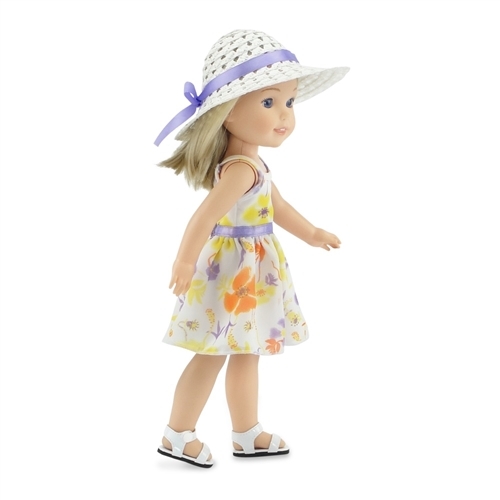 Paired with an accentuating soft, purple ribbon waistband and a wide-brimmed white hat with matching purple ribbon, your lovely American Girl doll and her dress will be a hit all season long. This gorgeous, yellow, purple and orange-flowered, casual dress features our special "no grab" Velcro closure, which makes getting dressed easy. Buy one today and be ready for your next Easter event or Spring outing! 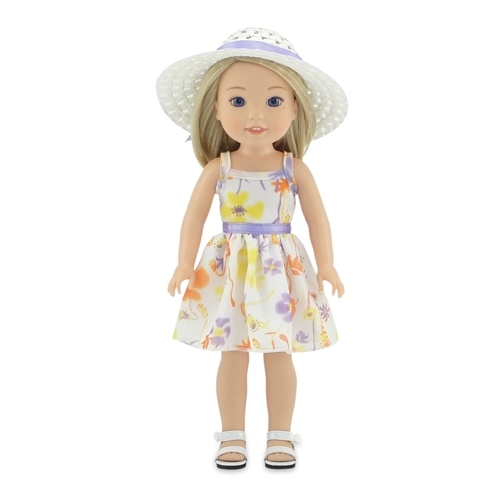 This pretty yellow chiffon doll sundress, with yellow, purple and orange flowers, is perfect for an outdoor party with friends! The lovely tea length party dress has a satiny purple waistband and comes with a white hat with matching purple ribbon. Doll clothing made to fit 14-inch dolls such as American Girl Wellie Wishers ®, Hearts for Hearts Girls, Glitter Girls, etc. Doll and doll shoes not included.